Transport officials have confirmed today that a dead shark has been discovered on the subway in New York City. 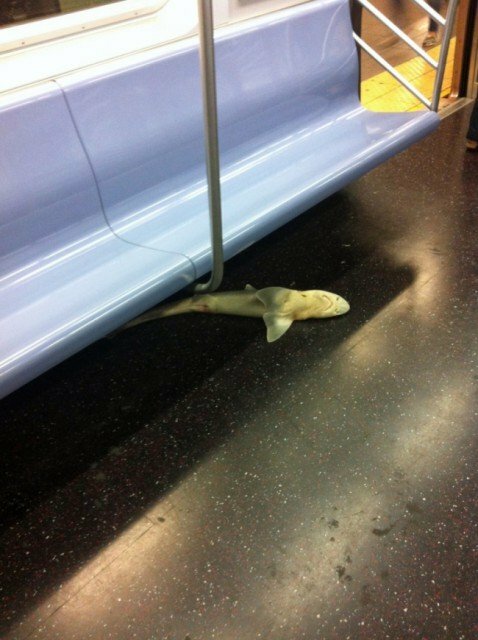 The shark, about 4 ft long, was found under a row of seats on a Queens-bound train. The conductor asked passengers to leave the carriage and the train continued to the end of the line, where a supervisor disposed of the shark. Pigeons and even an opossum have made their way on to the trains before, but never a shark, transit officials said. However, where it came from remains a mystery. Isvett Verde, of Brooklyn, New York, who took a photo of the shark, said she noticed that the empty carriage of the N train “smelled extremely fishy” when she boarded at 8th Street. “It’s hard to be surprised as there are always crazy things happening in this city, but even that was a bit much,” Isvett Verde said. Other pictures of the exotic discovery have also gone viral, including one of the shark with a cigarette in its mouth next to a fare card and a can of energy drink.